Taiga is the Russian word for forest and is the largest biome in the world. It stretches over Eurasia and North America. 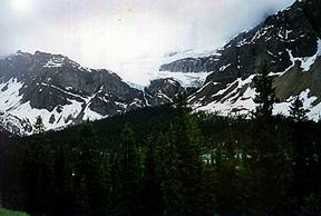 The taiga is located near the top of the world, just below the tundra biome. The winters in the taiga are very cold with only snowfall. The summers are warm, rainy, and humid. A lot of coniferous trees grow in the taiga. The taiga is also known as the boreal forest. Did you know that Boreal was the Greek goddess of the North Wind? The taiga doesn't have as many plant and animal species as the tropical or the deciduous forest biomes. It does have millions of insects in the summertime. Birds migrate there every year to nest and feed. Here is some information about the temperatures and weather in the taiga. The average temperature is below freezing for six months out of the year. The winter temperature range is -54 to -1° C (-65 to 30° F). The winters, as you can see, are really cold, with lots of snow. Temperature range in the summer gets as low as -7° C (20° F). The high in summer can be 21° C (70° F). The summers are mostly warm, rainy and humid. They are also very short with about 50 to 100 frost free days. The total precipitation in a year is 30 - 85 cm (12 - 33 in) . The forms the precipitation comes in are rain, snow and dew. Most of the precipitation in the taiga falls as rain in the summer. The main seasons in the taiga are winter and summer. The spring and autumn are so short, you hardly know they exist. It is either hot and humid or very cold in the taiga. There are not a lot of species of plants in the taiga because of the harsh conditions. Not many plants can survive the extreme cold of the taiga winter. There are some lichens and mosses, but most plants are coniferous trees like pine, white spruce, hemlock and douglas fir. Coniferous trees are also known as evergreens. They have long, thin waxy needles. The wax gives them some protection from freezing temperatures and from drying out. Evergreens don't loose their leaves in the winter like deciduous trees. They keep their needles all year long. This is so they can start photosynthesis as soon as the weather gets warm. The dark color of evergreen needles allows them to absorb heat from the sun and also helps them start photosynthesis early. Evergreens in the taiga tend to be thin and grow close together. This gives them protection from the cold and wind. Evergreens also are usually shaped like an upside down cone to protects the branches from breaking under the weight of all that snow. The snow slides right off the slanted branches. The taiga is susceptible to many wildfires. Trees have adapted by growing thick bark. The fires will burn away the upper canopy of the trees and let sunlight reach the ground. New plants will grow and provide food for animals that once could not live there because there were only evergreen trees. Animals of the taiga tend to be predators like the lynx and members of the weasel family like wolverines, bobcat, minks and ermine. They hunt herbivores like snowshoe rabbits, red squirrels and voles. Red deer, elk, and moose can be found in regions of the taiga where more deciduous trees grow. Many insect eating birds come to the taiga to breed. They leave when the breeding season is over. Seed eaters like finches and sparrows, and omnivorous birds like crows stay all year long. "Taiga Facts", http://www.hewett.norfolk.sch.uk/curric/NewGeog/Habitats/facts.htm, (June 2000). "Taiga Plants", http://www.richmond.edu/~ed344/webunits/biomes/tplants.html, (June 2000).